Site3 – containing 2 DCs. Let’s call this central site. All domain controllers are Global Catalogs. Replication was set manually. It’s configured to be in star topology with median in Site3. For each connection was defined newInter-Site Transport in AD Sites. Replication works fine. Exchange servers are able to resolve all domain controler. I have checked this using DNS and also nltest. There are four Exchange 2012 servers. Two are CAS/HUB servers put into CAS Array. CAS Servers and CAS Array IP addresses belong to Site4 IP Subnet. And two Mailbox server that are put into DAG. Both mailbox server and DAG IP addresses are in Site4. Problem is that one CAS/HUB and one Mailbox server are physically located in Site4 and one CAS/HUB and one Mailbox server are located physically in Site5. 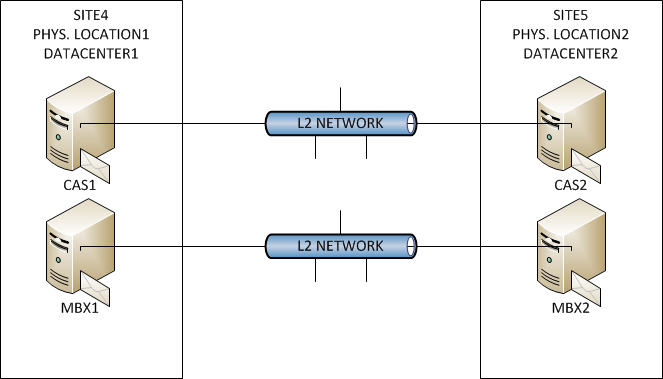 Between Site4 and Site5 are L2 networks for CAS/HUB and Mailbox server. Everything works fine. All IP subnets are assigned to Site4 which means all Exchange servers use primary Global Catalog functionality from domain controller from Site4. Idea from network/security guys was to allow Exchange servers to use Global Catalog just from domain controllers located in datacenters – Site4 and Site5. So firewalls don’t let Exchange server to use Global Catalog from other domain controller besides those located in Site4 and Site5. Problem appeared when domain controllers in Site4 went down. Exchange servers didn’t want to start and mount databases. Exchange didn’t use those out-of-site domain controllers, because firewalls blocked it – regarding network/security guys recomendations. Question was why exchange servers didn’t see and use other domain controllers? It sees and uses only those four domain controllers (two in same AD site and two from central site). My colleague tried to convince me to believe it’s good idea and Exchange tries to protect you from some problems. But I don’t see any point of Exchange not contacting all domain controllers and contacing only domain controllers in the site and contacting domain controlers which replicate with domain controllers in site. I don’t see a poing of Exchange not trying to connect to Global Catalogs in Site1, Site2 and Site5. So this is the way Exchange looks for Global Catalog servers by design. I’ve done couple testing scenarios. This is really proof of problem with Exchange locating DCs. Create new AD Site only for all Exchange IP Subnets and add two domain controllers into this new created AD Site. 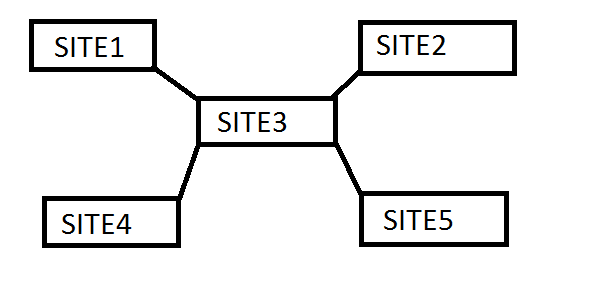 One DC would be located in physical location 1/datacenter 1 (with CAS1 and MBX1 servers) and other DC would be located in physical location 2/datacenter 2 (with CAS2 and MBX2 servers). Create new AD Inter-site Transport between Site4 and Site5. We decided to create new AD Inter-site Transport.